PetFinder.my Visual Map Feature - Launched! Introducing the latest PetFinder.my feature to make adoptions and finding lost pets more effective! To access it, click on the Visual Maps tab at the top of the page. 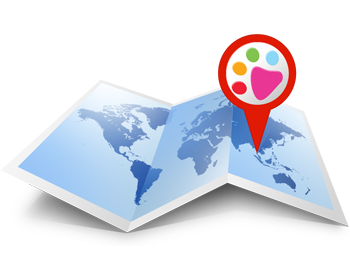 Now you can pinpoint the exact location where your pet was lost on our Visual Map. When people view your pet profile, the location map will be displayed, and if he lives around that area, he'd likely take extra notice of the pet and keep a closer lookout for it. The actual power of this is realized when we leverage upon our recently launched iPhone and Mobile network, where our system would show them lost pets that are within their current whereabouts. For example, when you are at Jalan ABC having a drink and the PetFinder.my app shows you pets reported lost within a 2-kilometer radius, or even pushes the alerts to you if you have subscribed to it. Imagine how much more effective it is in giving exposure to lost pets, when people are more aware and actively looking out for these animals. Now everybody can easily contribute to being part of a Search & Rescue effort, wherever they are. The same principle applies to pets that are found wandering around. The rescuer can mark the location where the pet was found, and the owner in search of his beloved pet can access our system to see what pets have been reportedly found within the vicinity where his pet was lost. Animal shelters or avid pet rescuers can now show their location easily to potential adopters. The person can also view a full, enlarged map and get driving directions immediately, saving the shelter/rescuer a lot of hassle in explaining how to get to their place. Furthermore, people interested in adopting pets can now instantly use our mobile system to view pets nearby that are available for adoption. This gives better exposure to a larger variety of pets and rescuers, as well as allows the potential adopter to quickly schedule adoption appointments based on his current location. Fill In Your Visual Map Info Now! If you have a Lost / Found pet profile, we strongly recommend that you fill in this info asap to take advantage of the new feature. You may also want to do so if you are publishing pets for adoption. This function can be accessed when you edit your account, or when you create/edit a pet profile. If you are concerned of your privacy, you need not pinpoint the exact number and location of your house - you can always point it to a few houses away or the next road, that should still be good enough to provide the desired effects. Please note that the iPhone and Mobile features described above are not yet released, as we need to first collect sufficient map data from our users to provide effective results. We hope to launch the updated mobile features within a month or so. Please let us know if you come across any bugs or problems while using the maps, thanks! Last edited by AndyKoh; 08-17-2010 at 03:03 PM. Re: PetFinder.my Google Maps Feature - Launched! The Visual Map feature has been activated, you can access it from the top navigation bar. Right now there are not many icons as people have yet to mark their physical locations on the map. If you have any pets for adoption or lost/found animals, do enable Visual Map for better exposure.